If you have a not so powerful mining rig or and ASIC and you want to be able to effectively mine on multiple pools that use variable difficulty instead of a fixed one it might be a bit of an issue. Usually on vardiff pools you start with a lower difficulty that might be right for the hashrate of your mining hardware, but the pool starts to increase the difficulty over time making it hard for your miner to keep up to its maximum performance, especially if using multipool that switches coins or solves blocks quickly. CGminer and the other alternative mining software products do come with strategies for effectively utilizing multipool scenarios, you just make sure you use the right one depending on your situation. By default the multipool strategy used by the mining software is set to failover, meaning that if the first pool stops responding the miner will move on the next one in the list until the higher priority pool is back online. Obviously the above default scenario does not work for vardiff pools to keep your miner at the recommended lower difficulty level, so you need to use one of the different strategies in order to be able to do that. The right strategy for using multiple vardiff pools is the rotate strategy where the miner will automatically switch between the list of pools based on a user set time interval. So checking what time it requires for the pool to switch from the initial difficulty of lets say 128 to 256 and then to move to 512 will give you an idea on how many minutes you need to set for the rotate rounds. 128 and 256 difficulty is OK for Bitcoin ASIC miners that are in the range of 150-200 GHS for example, so setting lets say 5 minutes for the rotation interval should prevent the pool to go higher than 256 difficulty. What the miner will do is move to the next vardiff pool in the list for 5 minutes and then get back to the first pool for 5 more minutes and so on, keeping a difficulty of 128-256 on both pools. This is a great strategy for using with NieHash and WestHash for selling your SHA256 hashrate for example if you have a not so powerful ASIC miner. 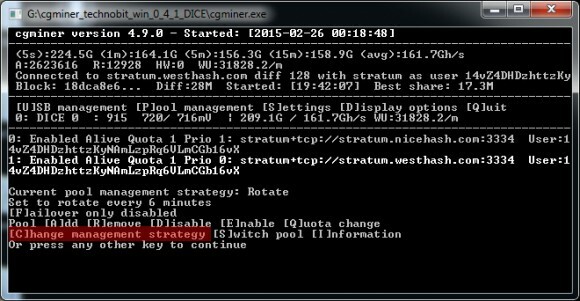 Changing the multipool strategies is possible from within the already running cgminer or another miner forked from it or with support for the same options, but this will not be permanent – it will function until the restart of the miner. You can also set the rotate mode to be activated with a startup parameter of the miner by adding this to the command line --rotate 5, the example is for 5 minute rotation between the list of pools.